simplecall brings you an amazing opportunity to make calls to your friends and family in the Philippines for a very cheap rate. Our name depicts what we are - we make life simpler. simplecall is PINless, meaning that you don't have to dial complicated PIN numbers. You don't have to carry your plastic calling card around because once you have registered with simplecall, our systems will automatically recognise you so that the next time you attempt at making a call, you can do it without any hassle! Making a call to Philippines starts from 17.08¢ /min to landlines and mobiles. Since your account is available online, you have the ability to monitor your call history and expenses. 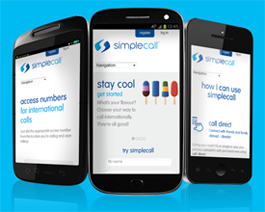 All you have to do to start benefiting from the many features of our international calling service is visit www.simplecall.com and register your name and number. simplecall believes in transparency, which is why our price is always displayed on our website so there are no hidden costs. So, next time you call abroad, use simplecall to call your friends or family. The Philippines is the 12th most populated nation and the 40th largest economy in the world. Goldman Sachs described the Philippines as one of the Next Eleven economies. With huge deposit of natural resources, a hard working population and a crucial strategic location, the Philippines is rising fast in the global economy. There are over 3 million Filipinos who live in the US - Bruno Mars being one of the most famous.